Me and sleep are not really the best of friends. Don't get me wrong I enjoy a good sleep and do like a lay in rather than having to jump out of bed for something (like a 6am call time in London) but sleep seems like such a waste of time. Just imagine all the extra things you could get done if we didn't have to sleep. Evolving past having to sleep every night (or at all) can't come soon enough for me, although I think we're a fare way off that yet! I've always been a night owl and as I don't work 9 to 5 my bed time is usually 2am (again not great when I have a 6am call time in London). Unfortunately I do also sometimes suffer with periods of insomnia, which can see me not getting to sleep until maybe 4am and then waking up at something like 9am, and there's nothing more annoying than wanting to sleep and not being able to. So I don't always get the beauty sleep that me or my skin needs. I also suffer with dehydration and just generally dull skin, so my face is far from glowing. When Escentual asked if I was interested in trying the Vichy Idealia Skin sleep Recovery night gel-balm* of course I said yes. A night cream that could make my skin look like I've slept for a week? Get-on-my-face-right-now! 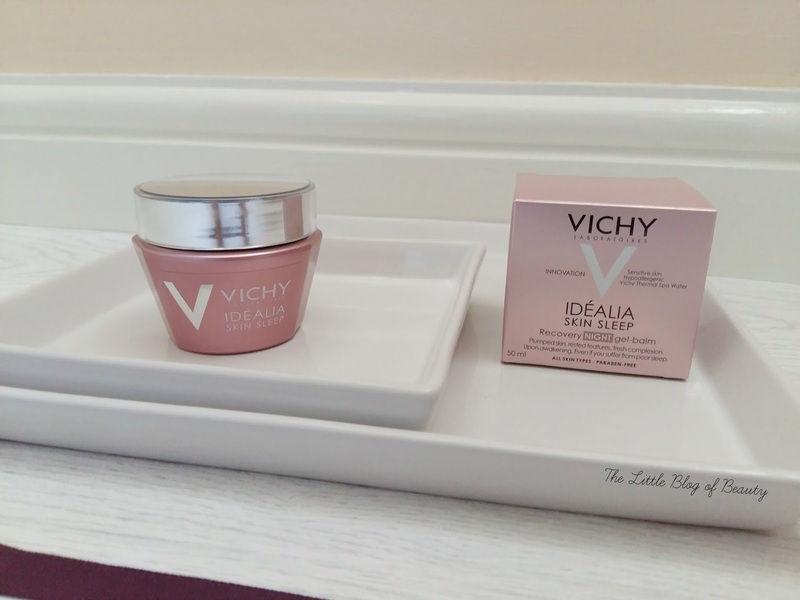 The idea behind the Vichy Idéalia Skin sleep is that even if you suffer from poor or a lack of sleep you'll wake up to plumped skin, rested features and a fresh complexion. I think this is such a good idea for a product as so many people suffer from sleep problems and thanks to our increasingly busy and stressful lifestyles, mobile devices and social media the problem is just getting worse. It's designed to stimulate functions in the skin that should occur in deep sleep such as microcirculation and barrier function. It contains hyaluronic acid to stimulate cell regeneration, salicylic acid to smooth and even texture and caffeine to decongest the skin and stimulate circulation. The product does however also contain alcohol denat, so this is worth bearing in mind if you're sensitive to alcohol in your products. For maximum results the product should be used in conjunction with facial massage and when you take the pot out of the box you'll find written and illustrated instructions on how to do this printed inside. I was pleased to see this is a gel-creme formula as my skin really does prefer these over heavier creams. 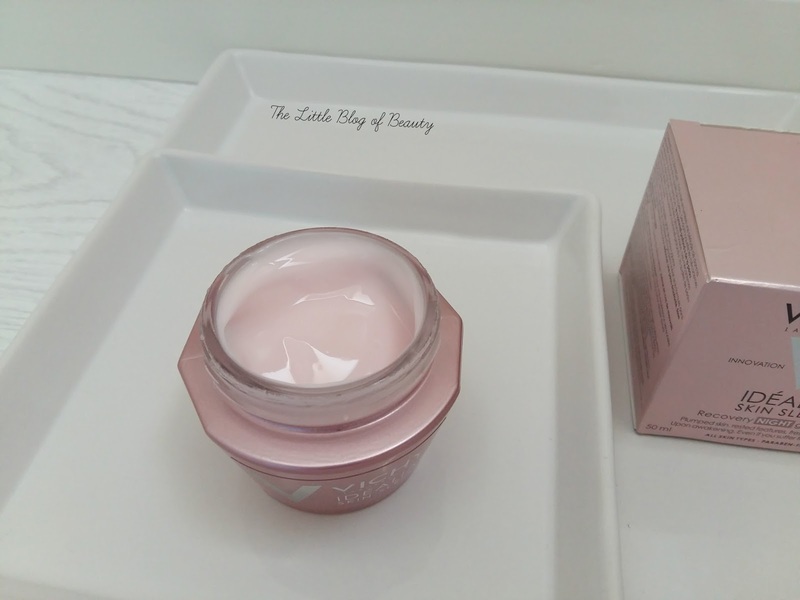 The gel-cream is a very light pink colour and I think I can also detect a very light scent. Despite being a gel-creme this does feel quite rich and I thought it might take a few minutes to sink in, but it actually absorbs quite quickly and only leaves a slight stickiness on my skin that I really don't mind at night. I've been using this for a few weeks now and I'm really impressed. My skin rarely glows in any way, it's just destined to forever be dull, but while using this I've been waking up to fresh, glowing skin. There's not a lot more to say really, it just works, and if you suffer with dull skin or lack of sleep I'd recommend giving this a try. Vichy Idéalia Skin sleep is usually £26.50 but as it's currently French pharmacy month on Escentual you can get it for just £17.66 (a third off!). It's currently out of stock but you can still order it and according to the website it should be despatched within a week. I'm absolutely dying to try this!